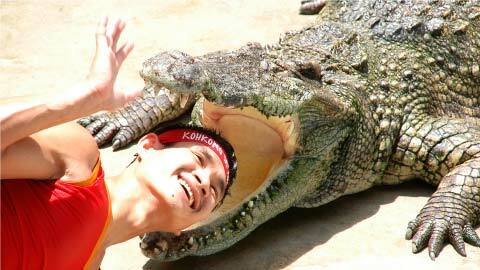 Koh Kong Safari World is located very close to the border with Thailand. It is part of a complex which includes a casino. Gambling is illegal in Thailand but Thais love to gamble and so most border crossing points between the two countries have a casino. It's just like Poipet, another gambling town at the border of Thailand. 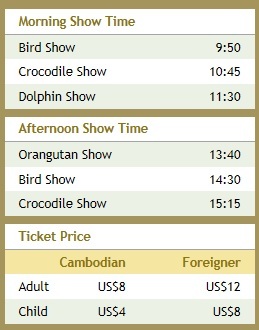 It would seem then that the Koh Kong Safari World is really there to offer casino visitors and their families something extra to do during their visit. Your tiredness and stress are completely taken away by our amazing animal shows. Your true amusement park is coming into your mind to weigh your option of next travel destination. The Safari World is open every day of the year from 09.00 till 17.00 hours. The site covers just over 60 acres (though seems smaller) and is said to house some 800 specimens representing nearly 100 species. There is also a two-way caterpillar train services between hotel and Safari World. The entrance fee for adults is US 12,- and for children US 8,- There are shows in the morning and the afternoon. 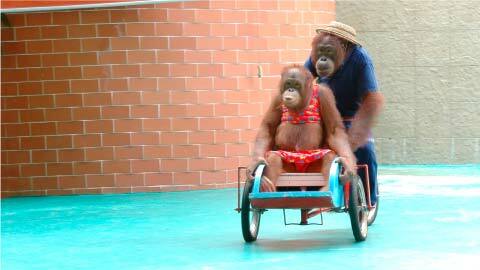 These include shows of Orangutans, Dolphins, Birds, Sealions and Crocodiles. Animal welfare may not be the primary consideration at Koh Kong Safari World, but that doesn't keep you from enjoying the shows. The park has the usual zoo animals, but it also puts on the sort of live-animal shows, that are banned in most countries. There are performances reminiscent of a 19th-century circus show. Every morning, and into the early afternoon, birds ride tiny bicycles, orang-utans dressed up as boxers throw punches and a man puts his head inside a crocodile's mouth. Koh Kong Safari World offers an exceptional experience and unsurpassed extraordinary memories of the nature, making it a great place for a walk to see wild life. The pool of the crocodiles are nice. The bear and tiger enclosures too, though they had gone over the top a bit with their electric fences. The grounds are smart, well planted, laid out and watered. The staff are helpful, neatly dressed and polite. The show areas are immaculately clean and well designed and maintained. The sealion show was clever, impressive and very entertaining. The amazing and thrilling moment rarely happens anywhere else in the world where a human play with most dangerous fresh water creature. 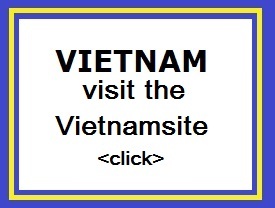 It�s worth seeing by your own eyes rather than just an earshot that a human is taking his head and place into crocodile�s mouth, which is known as the hell�s gate. Dolphins have become the famous stars in Koh Kong Safari World since its first official performance in 2003. 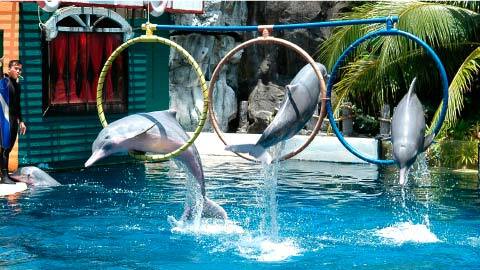 Dolphin Show is performed in a large and modern designed theater having hundred seats to accommodate guests at a time. Your laughter is unlimited as Orangutans� skills and activities are full of pleasure and appreciation to entertain and drive away visitors� fatigue by building up the newest and most unforgettable memories. Organize your next destination to Koh Kong Safari World to be part of the most amazing world.